It’s rapidly approaching the point where every album that’s released will have its own genre classification. It used to be so easy at Syd Booth in Mansfield (Nottinghamshire not Ohio) when all you had was racks of vinyl labelled ‘Rock’, ‘Soul’, ‘Easy Listening’, and a couple of Trojan compilations hidden at the back. But not any more, and “Here and Gone Again” is a perfect example. It’s music made in the American folk tradition and in a busking style, but there are hints of gypsy jazz, country rock, Eastern European folk and maybe even a smattering of pop as well. Top that up with a choice of two lead vocals, spot-on harmonies and any number of tempo changes and you can safely that no-one’s going to get bored listening to this. 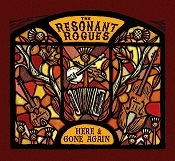 Resonant Rogues have packed a lot into the two years since their formation, from New Orleans to the Balkans via France and the Blue Ridge Mountains, and most if it is evident in this release. The group’s two songwriters are Sparrow (vocals, accordion and banjo) and Keith J Smith (vocals, guitar and percussion) and they’re accompanied on “Here and Gone Again” by Craig Sandberg (upright bass and harmonies) and Drayton Aldridge (violin and harmonies) with guest appearances from Squirrel Nut Zippers’ Je Widenhouse (trumpet) and Honeycutters’ Matt Smith (pedal steel). The album’s opener, “Make us Stay” is an upbeat, country/rock piece with lovely harmonies and some nice fiddle which sets the listener up nicely for eleven very varied songs. From the doom-laden, minor key atmospherics and fiddle solo of “Weary Head” to the frantic, uptempo mania of “Waiting for the Rain” (with accordion, trumpet and upright bass solo), the album covers a huge musical area. “End of the Day” and “Tomorrow” (the album’s closer) are both in waltz time, while “Break it Off”, “Everyday Blues” and “Overland” build up the drama by using tempo changes and dynamics. There’s even a nod to Latin-American dance rhythms in “Fall with Me”. There’s a joie de vivre about the songs and the performances making the album an exhilarating roller-coaster ride through American and European folk music which never quite makes it over the line between very good and exceptional, although it holds out huge promise for their live performances. The UK release date for “Here and Gone Again” is July 24.